This PDF features Lama Zopa Rinpoche's Samantabhadra card for protection. 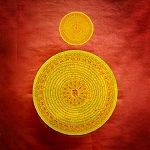 “This Samantabhadra protection comes from the great lama Thugyen Chokyi Nyima. It eliminates bad things, creates outer and inner success, and can also prevent all the bad extremes of the earth. 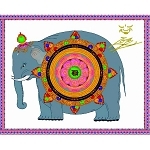 The main deity is the Bodhisattva Samantabhadra, white in color, riding an elephant, his two hands carrying a container filled with piles of jewels. 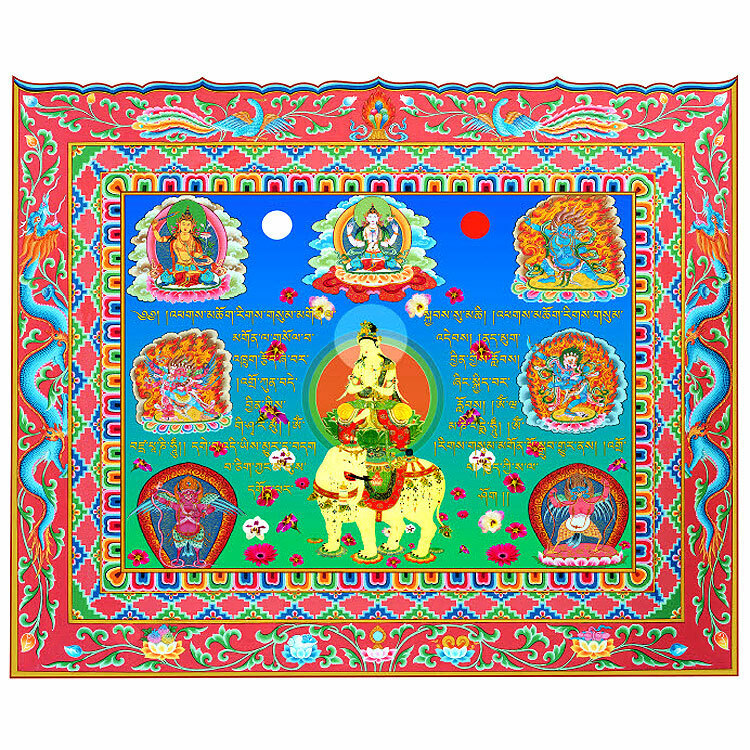 Above are the three types of deities: Chenrezig, Vajrapani, and Manjushri. On one side is Hayagriva and on the other is Lion-Faced Dakini. Below are the two kinds of garudas: Multi-Colored Garuda and Black Garuda. … By displaying this card, all the outer and inner evil enemies (living beings or bad feng shui) are stopped. It was said by Vajradharma, who is the all knowing one, that this instruction can stop any kind of harm, including the nine harms. By displaying this protection in the house, activities that take place in the house and have no meaning will become meaningful and virtue will be created. In this way, having this protection in the home becomes good feng shui, a way of creating an auspicious environment." Note: When you get this protection card, first consecrate it well. Then put it above the front door or place it in different parts of the house: above windows, to the side of the front door (outside), etc. The image should be protected and not destroyed by rain. Click here to download instructions for a brief consecration ritual. The ceremony should be preceded by a guru yoga practice such as Lama Tsongkhapa Guru Yoga, complete with refuge and bodhichitta, the four immeasurable thoughts, mandala offering, and recitation of the Migtsema mantra. Size: approx. 7.5 x 9.5 inches (18 x 24 cm).